The running joke among my friends and colleagues is that I’m sorely in need of a vice. They’re sort of right: I don’t drink. I don’t smoke (anymore). I don’t do drugs. I don’t sleep with anyone, these days married men. Older men used to be a weakness of mine, but I’ve grown out of it. I don’t cheat or steal. I go to bed early (unless I’m working late), and wake up early. I’m always almost always on time for work. What’s a girl to do? It’s not as though I’m about to take up gambling. When my friends point out my lack of vice, I either admit defeat or launch into a long rant about how I hate the whole idea of “vice,” because it implies that everyday life is lacking in pleasure and fun, which makes us crave the forbidden, which is a fundamentally depressing for so many reasons…and so on, and so forth. But let’s face it, they have a point. We all enjoy channeling our inner teenager, and that’s what we do with the occasional misdeed. It’s exhilarating to break a rule, or a norm. Do I think that “vice” is fundamentally overrated? Sure. If you’re counting the moments to your next drink, or line, or joint, or you next illicit liaison or inadvisable shopping spree, you probably need to invest your everyday existence with a lot more passion and fulfillment. But once in a while, it’s fun to play with the idea of vice. Which brings me to the title of this post. You guys know about my love of coffee, right? I hesitate to even call it a vice, because a) in moderation, coffee isn’t so bad for you, and b) vice implies something off-limits, and believe me, coffee is hardly off limits in Gena-land. I really can’t think of a habit I’m less interested in changing. But in the grand scheme of my health freak lifestyle, I’d have to say that my java fixation wins the “one of these things is not like the other” award. Especially when it’s flanked by green juice and kale salads and beans! It was Sunday, and I’d just whipped up a sumptuous banana smoothie for breakfast. I was about to serve it up, when my eye caught the little red box of Via in my pantry. Hmmm, I thought. Wouldn’t this smoothie be better if it were coffee-flavored? 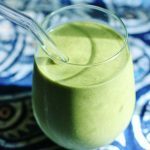 Blend all ingredients in a blender on high. Add more nut milk if needed. Yes. Sometimes it’s fun to make mischief. After I made this, I realized that the smoothie was not only infused with coffee, but coffee that’s corporate and neither organic or fair trade. Meh. Those concessions to imperfection are way less cute than my original one. But I bought the box for travel emergencies, and I buy organic and fair trade the rest of the time, so I’m just going to put Via in the “imperfect” category, and leave it at that. Speaking of non-mischevious smoothies, I also recently tried my friend Kristen’s much adored chocolate cherry bomb for the first time. Well, I certainly see what all of the fuss is about! It’s decadent and delicious. I’m not a cherry fan, but fortunately, they were fairly submerged beneath choco-banana bliss, and just lent a hint of flavor to the drink. Another winner! Thanks, Mama-to-be. With that, I wish you all a good night–naughty or nice! and then back to organic + free trade ! that looks delicious, either way. the addition of coconut butter in a smoothie intrigues me more than anything (especially with hazelnut milk!). i remember those days after high school when i would get a giant frappuccino with whipped cream… wow those were the days. haha! hahaha, i have a vice or two to share! That looks like a great idea. I have an entire box of via I haven’t even tried! I even bought the travel mug! I have been doing the same thing for awhile now. I LOVE smoothies with Starbucks VIA in it!! Coffee would be my “vice” too. The other morning I was super late and it was really hot out, so I put coffee in my green smoothie – in theory it seemed disjointed but in reality it was amazing. 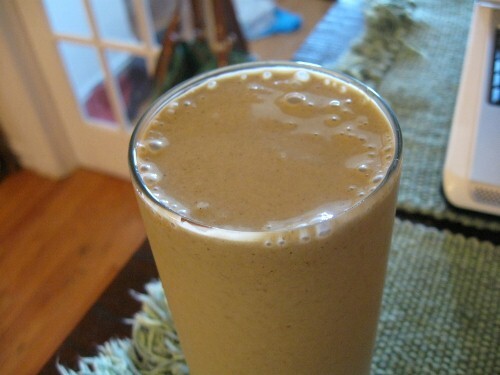 Romaine, peanut butter, almond milk, coffee, cocoa powder, cinnamon, ice ice baby. Definitely a “vice” concept – the way I always used to think of fraps as a “special treat.” Don’t get me wrong, cawfee is my thing, I’m into it, but I try not to drink too much of it because I am prone to dehydrate easily. But I’ll act surprised when some instant coffee accidentally ends up in my breakfast smoothie tomorrow (which, incidentally, is generally a chocolate-cherry smoothie these days). Gena, I shudder to think of how sinful you would consider my idea of a mischievous meal/snack/dessert. You might never talk to me again. Its amazing how we can change our lives around! You’re amazing Gena. Coffee is not a vice, as long as you aren’t ADDICTED to it which doesnt seem to be the case at all. 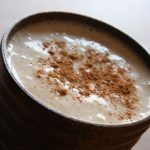 Coffee-banana smoothies…sounds good to me!! Gena, I love your blog-honesty! Thank you for being so open and honest- it makes for an engaging read! Will definitely try some instant coffee in my next smoothie. I’m all over coffee in smoothies 😀 And those Starbucks via packets are the best instant coffee I’ve ever tried! That sounds delicious!!!!! Hey, at least it isn’t with whip cream and sugar-loaded! i drink my coffee with stevia and almond milk, and it’s a lovely treat. Do you have a brand of hemp protein that you like the most? Kristen’s chocolate cherry bomb is sooo good. I’m going to have to try your sinful smoothie. As far as vices go, I’m pretty good. I don’t smoke, drink, do drugs, and I’m married so my husband frowns upon the sleeping around. 😉 I do love coffee and have a tendency to stay up too late, but I’ve been working on it (the staying up not the coffee)! I’m always doing a lot of sweet vegan baking for friends and family at their requests, but I’m pretty good at staying out of it myself or just taking one. On a side note, we’re going on our Chicago trip in a week- can’t wait to try the great vegan places you posted about! I think we’re twins. HAHAHAHHAHAHA!!! I’ve been toying with adding coffee to some of my smoothies. Like you, I LURVE my coffee. However, my one concern is about whether or not the coffee impedes absorption of all those wonderful nutrients in the smoothie. I second this question! I sometimes add a spoonful of instant coffee to my banana, spinach, cashew milk and mint smoothie for a mocha-mint flava but I always wonder if it kind of negates the good stuff from the fruit, veggie and nut milk. I’ve totally done this. Like Brittany said, there’s healthier ways to do this. Its easy to find a hand full of green coffee beans in Portland, land of small-batch roasters. Ground ’em in a coffee grinder. Soak ’em overnight, like you would a cold-press coffee. Basically raw coffee extract. Yes, I think the point was that I wasn’t really looking to make a healthier or more virtuous choice 😉 But this is a good idea! 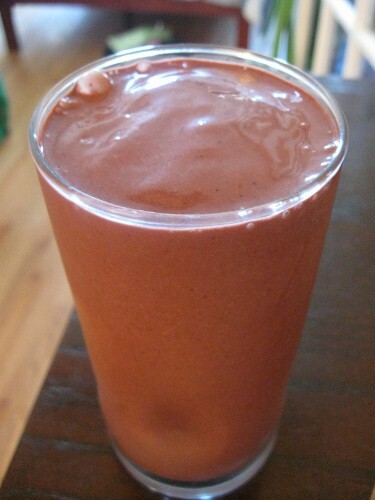 I just tried that smoothie last night — the cherry one, but i added some spinach… it was really good! I like the idea of slipping coffee into food here and there. i can’t handle coffee on its own anymore (it doesnt like my tummy) but I did and still do LOVE the taste… and I think this is just enough balance that I can have the best of both worlds. sorry i've been a comment slacker lately- i'm always reading though! 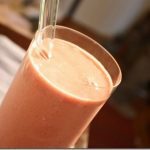 I love this smoothie idea, but I could only have in the morning because I’ve become hyper-sensitive to caffiene. But this sounds like an ideal add to my breadfast smoothies for my busy weekend. I don’t drink coffee because my body cannot take a lot of caffeine without going completely haywire, but my husband LOVES the stuff…and he doesn’t suffer from core meltdown like I do! This smoothie is such a great idea, I can’t wait to whip one up for him. He will be thrilled, thanks, Gena! The vice you have no interest in changing (coffee) and that in moderation it’s not some horrible terrible thing..THANK YOU and I agree! And I need to finally try Kristen’s Choc Cherry Bomb too..
Have a stellar weekend, Gena! Yea!!! I’m so glad Gena has a vice! I’ve always thought of you as totally perfect. Seriously. I didn’t believe you had any vices left. But now we know your dirty little secret, which isn’t really that dirty at all. But hey, it’s relative right? You know I love coffee more than anything in the world, so I must try this! It is fun to be a little sinful at times 🙂 I think we all have it in us. We drink coffee every now and than, and when I drink it I do enjoy it but later that day I do feel guilty, ugh. HAHA. I’ve never been a coffee drinker. Tea, hot chocolate, hot cocoa, etc…yes…but coffee, nope! 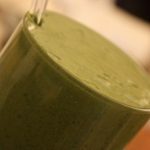 I have been looking for a great coffee drink to make in my blender. The others have all been too ‘watery’. I have tried to not make them as sweet as the coffee houses…so they are not coming out as I like them. However, I think I may be on to something with your recipe. I am not big on the frozen coffee drinks, but if I omit the ice and put a reg banana, no frozen, and instant coffee instead of brewed coffee…I may have a start to something. Thanks for the recipe. That’s definitely better than what I had today! I had a Starbucks Decaf Coffee Frappuccino…with soymilk though! Hard to resist the temptations on a hot day! If this is your only vice, you are in good shape, sister. I, on the other hand, had two glasses of champagne tonight celebrating my court victory. Ugh. I should’ve had a green juice. Or a sinful smoothie. Happy weekend (or in Gena terms, day when you don’t have to officially go to the office but still accomplish more than most people do all week)! 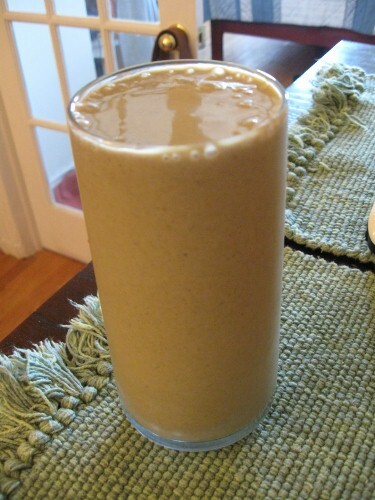 I already make this smoothie (even w the same starbucks instant coffee!) but I add a spoonfull of raw almond butter too. It’s the only coffee I ever have and it’s a bit of a treat, but so worth it! Glad you enjoy it too. i’m writing an email as we speak. you’ll be getting it soon! <3 you! Lol, I annoy my workplace with my constant giving up of vices, first i became vegetarian (3 years, woo! ), then I gave up diet coke and most artificial sweeteners, then coffee, now caffiene and chocolate. The only vice I seem to have left is crisps, which will hopefully die soon. I truly don’t think we need vices, I think it is just a support mechanism which if people tried hard enough they could just be rid off. 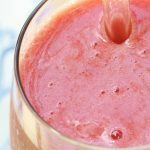 I love the sound of the smoothie though, I have to try it without the coffee, I recently tried a cherry chocolate bomb and found it to be delicious so I know I have to experiment now with more. i cant find the link for all you lovelies, but Frank Giglio posted a video around the holidays re: making a nutritious coffee beverage. i usually cold-brew (or french press, if i’m rushed) coffee and add milk (him: raw grass fed cream, me: coconut milk) and add maca, cacao, tocos, coconut oil and other yummies. i think he adds powdered reishi or chaga too. its amazing and balancing, and takes the edge off. Mmm, I love the coffee-hazelnut mylk combo! I just made a variation of this, and it was delicious! I added 1/4 c. raw cacao powder to the mix, which was even more decadent!